Villa Ipanema has four ensuite master bedrooms, geared towards groups. Outfitted with open-air living and well-lit pool areas that host a lush garden to further soak up the tropics, perfected by a secluded upper deck with generous views. 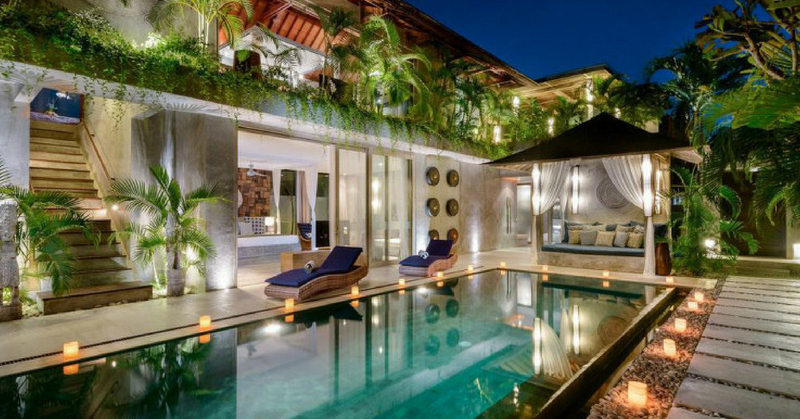 The traditional Balinese wooden roof adds to the untainted beauty of the villa, blending together with the magnetic French windows to create symmetry for restfulness. Designer lighting brightens the dining room, joining the warm and natural wooden touches in an elegant, faux-stone kitchen. Bedrooms fit for royalty are furnished with four-poster king beds and large mirrors that complement the traditional Balinese décor. Extra perks include cozy lounge furniture and comfortable workspaces. Bathrooms are intended to exude the famous feel of Bali, accomplished by the raw stone features, energizing flora, and wooden foundations; hence rewarding guests with the freshness of the outdoors within the comforts of luxury at all times.